Sylvia Earle, oceanographer, is just about the coolest person I had never heard of before I read this book. Sylvia fell in love, hard, with the ocean as a child when her family moved to Florida. She immediately started investigating the life teeming there, and by the age of sixteen was using diving gear for the first time. She would go on to dive deeper and deeper, encountering life from the tiniest of creatures to the gigantic humpback whale. She even spent two weeks living underwater at a deep sea station fifty feet below, and holds a record for walking on the ocean floor at 1,250 feet under, deeper than anyone ever had before or since. A true lover of the ocean and all its inhabitants, Sylvia has dedicated herself to educating people about the wonders of the ocean. She feels that the best way to get people to care about the oceans and to take action on behalf of their stewardship is to educate them. With its straightforward and gentle narrative, accompanied by beautifully detailed illustrations, this book inspires wonder at the natural world. The narrative itself focuses on Sylvia’s life of diving and details of the ocean life and landscape she encountered on her dives. An author’s note explains more about why the oceans are in danger, and will hopefully inspire a desire to learn more (a selected bibliography is also included) and to become an advocate for our oceans. Life in the Ocean is a beautiful picture book about an inspiring woman and the incredible oceans that she loves. When I saw the description of this story, I knew it would be the perfect title to share with my little one. My son can relate to the main character in Chu’s Day…they both have powerful sneezes. Throughout the day, Chu has a number of close calls that his parents are prepared for. However, when no one is paying attention he lets out a mighty sneeze. Kids will enjoy looking at the detailed illustrations and anticipating when Chu will finally sneeze. This month, in honor of the library’s 100th anniversary, Sarah shares a book about change over the years–A Street Through Time by Steve Noon. Once a year the people of Quill gather together for the purge where it is announced whether each 13 year old is Wanted, Necessary, or Unwanted. The Wanteds are groomed to become the future leaders of Quill. The Necessaries are trained in a trade like food preparation or elder care. The Unwanteds are disposed of, and the people of Quill are instructed never to think of them again. On the day of the purge during Alex’s 13th year of life, no one is surprised when his name is not among those deemed Unwanted. Alex has had numerous infractions over the course of his short life; he has known his fate since he was ten. It is a surprise, however, to hear that his identical twin brother Aaron has been chosen as a Wanted. As Aaron prepares for his new life at Wanted University where he will study to become one of the powerful members of the society of Quill, Alex is transported with the other Unwanteds to be disposed of in the lake of boiling oil, or so he believes. In reality, the Unwanteds are taken to the land of Artimѐ where they will be taught to harness their creative gifts and turn them into magic in preparation for a future battle with the army of Quill. Alex, suddenly thrown into a world where self expression is encouraged and emotions are no longer forbidden as they are in Quill, finds himself missing his brother Aaron terribly. While Aaron, who is on the fast track to a very powerful career at the right hand of the High Priest of Quill, has all but put Alex completely out of his mind. However, both Alex and Aaron struggle with dreams of each other. Alex works diligently to find a way to bring Aaron to Artimѐ, while Aaron fights to stop his forbidden dreams altogether. Will the bond between the twins prove to be stronger than Aaron’s thirst for power? Or are the brothers really not so different from one another? It will take a battle unlike any that Quill has ever seen to uncover the answers to these and other questions. 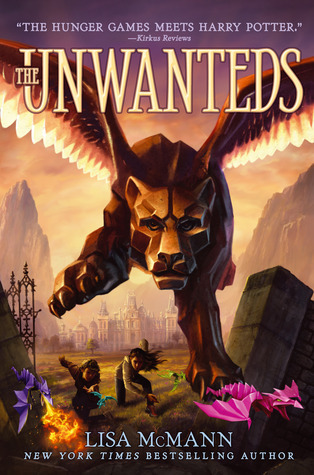 The Unwanteds is a fast-paced, exciting, and whimsically dystopian journey filled with a variety of delightful characters both human and mythical. Narrator Simon Jones does a wonderful job bringing each of these characters to life in the delightful audiobook edition. Simba, the giant winged cheetah statue, is particularly well done with his deep gravelly tenor effectively conveying the beast’s size and power. Jones’ timing is excellent and fits the pace of the story well. Young fans of Harry Potter and The Hunger Games will enjoy the magic and adventure that this story has to offer. This would make for great listening on a summer road trip for a family with children in grades 4 through 8. If you were eleven years old, would you pass up a trip to India with your parents to visit your relatives and instead choose to stay with an uncle on a small island off the coast of Washington State? The girl in this book, Poppy Ray, does exactly that. Her uncle is a veterinarian and Poppy thinks that she wants to be a vet when she grows up. She even has her own veterinarian medical kit which she takes with her. Unfortunately, when she actually gets there, she finds out that it is a lot tougher than she thought it would be. Her uncle is great and she loves the animals but she finds out that the sight of blood makes her sick and she has some trouble with the owners of the pets. There are heartwarming moments and heartbreaking moments and some wonderful characters in this book. How do you think Poppy will do with the trials and tribulations of a busy veterinarian’s office? I guess you will have to read it for yourself to find out! This clever rhyming picture book will have you jumping along too! Each little animal is just minding their own business, when along comes a bigger animal that makes them JUMP! Well, wouldn’t you jump if you were a cat, a fat little cat and were sleeping on a mat, and then you see a hound?? – wouldn’t you JUMP? The simple sing-songy rhythm of the story is infectious, and I think little kids and grown-ups will love it! Stuey Lewis is a quite a character! He’s a smart 2nd grader who has not only problems to deal with, but also funny schemes up his sleeve. The four chapters in this book are each like a short story about something in his life. While each chapter can easily stand alone, they come together to make a fun start to this great new series. In the first chapter we learn that Stuey has a secret at the beginning of 2nd grade – he’s worried that everyone will find out he isn’t a good reader. Even his best friend, who is an excellent reader, doesn’t know Stuey’s secret. It doesn’t take long for his teacher to realize that something is bothering him, and when he finally confesses his worry to her, she helps him realize everyone conquers reading in their own time. In the subsequent chapters, we read about the great Halloween caper that Stuey devises, his soccer team trials and the final days of 2nd grade. Each chapter is full of humor interwoven with tender moments. Whether listening to this story as a read-aloud or reading it on one’s own, we discover that there really is only one Stuey Lewis! I look forward to reading the next book Stuey Lewis Against All Odds: Stories from the Third Grade.